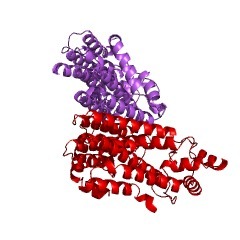 Helical motif in the GIT family of ADP-ribosylation factor GTPase-activating proteins, and in yeast Spa2p and Sph1p (CPP; unpublished results). In p95-APP1 the N-terminal GIT motif might be involved in binding PIX. This entry represents the Spa2 homology domain (SHD) domain found in the yeast Spa2/Sph1 protein and the mammalian GIT proteins. Budding yeast Spa2 is a component of the polarisome that functions in actin cytoskeletal organisation during polarized growth [(PUBMED:12361575)]. Its paralogue, Sph1, is involved in shmoo formation and bipolar bud site selection [(PUBMED:9443897)]. GIT is a GTPase-activating protein for the ADP ribosylation factor family. It may serve as a scaffold to bring together molecules to form signaling modules controlling vesicle trafficking, adhesion and cytoskeletal organisation [(PUBMED:11896197)]. Mutations in the Spa2 homology domain (SHD) domain of GIT1 described here interfere with the association of GIT1 with Piccolo, beta-PIX, and focal adhesion kinase [(PUBMED:12473661)]. There are 3024 GIT domains in 1498 proteins in SMART's nrdb database. Taxonomic distribution of proteins containing GIT domain. This tree includes only several representative species. The complete taxonomic breakdown of all proteins with GIT domain is also avaliable. Click on the protein counts, or double click on taxonomic names to display all proteins containing GIT domain in the selected taxonomic class. We recently characterized a novel protein, GIT1, that interacts with G protein-coupled receptor kinases and possesses ADP-ribosylation factor (ARF) GTPase-activating protein activity. A second ubiquitously expressed member of the GIT protein family, GIT2, has been identified in data base searches. GIT2 undergoes extensive alternative splicing and exists in at least 10 and potentially as many as 33 distinct forms. The longest form of GIT2 is colinear with GIT1 and shares the same domain structure, whereas one major splice variant prominent in immune tissues completely lacks the carboxyl-terminal domain. The other 32 potential variants arise from the independent alternative splicing of five internal regions in the center of the molecule but share both the amino-terminal ARF GTPase-activating protein domain and carboxyl-terminal domain. Both the long and short carboxyl-terminal variants of GIT2 are active as GTPase-activating proteins for ARF1, and both also interact with G protein-coupled receptor kinase 2 and with p21-activated kinase-interacting exchange factors complexed with p21-activated kinase but not with paxillin. Cellular overexpression of the longest variant of GIT2 leads to inhibition of beta(2)-adrenergic receptor sequestration, whereas the shortest splice variant appears inactive. Although GIT2 shares many properties with GIT1, it also exhibits both structural and functional diversity due to tissue-specific alternative splicing. beta2-Adrenergic receptor regulation by GIT1, a G protein-coupled receptor kinase-associated ADP ribosylation factor GTPase-activating protein. G protein-coupled receptor activation leads to the membrane recruitment and activation of G protein-coupled receptor kinases, which phosphorylate receptors and lead to their inactivation. We have identified a novel G protein-coupled receptor kinase-interacting protein, GIT1, that is a GTPase-activating protein (GAP) for the ADP ribosylation factor (ARF) family of small GTP-binding proteins. Overexpression of GIT1 leads to reduced beta2-adrenergic receptor signaling and increased receptor phosphorylation, which result from reduced receptor internalization and resensitization. These cellular effects of GIT1 require its intact ARF GAP activity and do not reflect regulation of GRK kinase activity. These results suggest an essential role for ARF proteins in regulating beta2-adrenergic receptor endocytosis. Moreover, they provide a mechanism for integration of receptor activation and endocytosis through regulation of ARF protein activation by GRK-mediated recruitment of the GIT1 ARF GAP to the plasma membrane. A small conserved domain in the yeast Spa2p is necessary and sufficient for its polarized localization. SPA2 encodes a yeast protein that is one of the first proteins to localize to sites of polarized growth, such as the shmoo tip and the incipient bud. The dynamics and requirements for Spa2p localization in living cells are examined using Spa2p green fluorescent protein fusions. Spa2p localizes to one edge of unbudded cells and subsequently is observable in the bud tip. Finally, during cytokinesis Spa2p is present as a ring at the mother-daughter bud neck. The bud emergence mutants bem1 and bem2 and mutants defective in the septins do not affect Spa2p localization to the bud tip. Strikingly, a small domain of Spa2p comprised of 150 amino acids is necessary and sufficient for localization to sites of polarized growth. This localization domain and the amino terminus of Spa2p are essential for its function in mating. Searching the yeast genome database revealed a previously uncharacterized protein which we name, Sph1p (a2p omolog), with significant homology to the localization domain and amino terminus of Spa2p. This protein also localizes to sites of polarized growth in budding and mating cells. SPH1, which is similar to SPA2, is required for bipolar budding and plays a role in shmoo formation. Overexpression of either Spa2p or Sph1p can block the localization of either protein fused to green fluorescent protein, suggesting that both Spa2p and Sph1p bind to and are localized by the same component. The identification of a 150-amino acid domain necessary and sufficient for localization of Spa2p to sites of polarized growth and the existence of this domain in another yeast protein Sph1p suggest that the early localization of these proteins may be mediated by a receptor that recognizes this small domain. This information is based on mapping of SMART genomic protein database to KEGG orthologous groups. Percentage points are related to the number of proteins with GIT domain which could be assigned to a KEGG orthologous group, and not all proteins containing GIT domain. Please note that proteins can be included in multiple pathways, ie. the numbers above will not always add up to 100%.